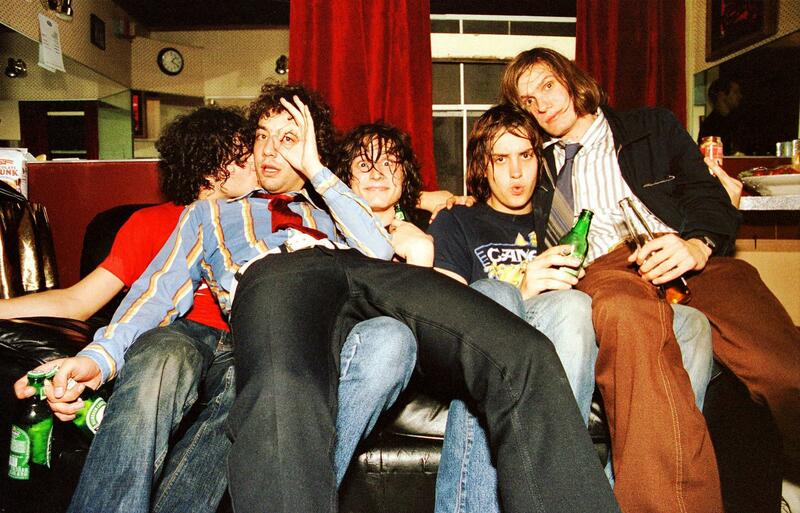 The Strokes backstage in San Francisco in October 2001, the month the band released its debut album, Is This It in the United States. In her new book, Meet Me in the Bathroom, author Lizzy Goodman constructs an oral history to tell the story of New York City rock and roll in the first decade of the 21st century. Though the period covered didn't happen that long ago, the scene's participants are now old enough, and maybe sober enough, to honestly reflect on what they went through during their highly scrutinized moment. Meet Me in the Bathroom covers standouts like The Strokes, LCD Soundsystem, Yeah Yeah Yeahs, Interpol and Vampire Weekend, but also includes stories about less-discussed influences, like Jonathan Fire*Eater and the Shout! parties that once ran wild. It also brings in groups that weren't from the city, like The Killers and Kings of Leon, but who followed the path that this scene paved for them. The New York bands of this era that didn't totally fall apart have long since transformed from upstarts to mainstays, reliable second-liners at festivals whose identities are no longer defined by what borough they live in. Goodman became a music journalist in the early part of the decade, covering what was happening in New York for outlets including Rolling Stone, Blender and NME. For Meet Me in the Bathroom she not only spoke with the artists, she also interviewed managers, publicists, music industry employees, comedians, journalists, bloggers, party promoters, party-goers and Moby. Of course Moby. Here she discusses the process of making the book and living through the time it covers. Eric Ducker: How long did it take you to write this book? Lizzy Goodman: Oh, just a quick five years or so. Really the idea came in 2011 at those Madison Square Garden shows where the book ends — LCD Soundsystem and The Strokes. I went to both of them and it was the genesis point of wanting to write about that period of time. Did it feel like the end of something? Yeah. I hate saying that, even though it's kind of true, because it sounds somehow fatal. I really don't feel that way about it at all. It felt more like a major chapter in my generation's story. That sounds pretentious on some level, but I could see the book's ending. I spent the summer before 9/11 happened in New York, among other summers. I was in college in Philadelphia at the time, but I was working in the city on my summer breaks. I saw that chunk of time [covered in the book] as a beginning, middle and end story. Not in so much as, "And now everything's over," but more in the case of these bands that were my peers and were up-and-coming and were a part of this swirling, confusing, chaotic, beautiful mess of New York City music, and they were now establishment rock stars. That was more the feeling, rather than like, "Something has died today." It was more like, "Something is beginning, and something else is concluding." Right, it wasn't as simple as, "This is the culmination." It was hard to think that since even though LCD Soundsystem was threatening to end — which under the current circumstances seems hilarious — it was such a celebration. And The Strokes show, they were just such consummate pro rock stars on stage. At LCD, there were limousines lined up outside Madison Square Garden. I spent the whole show watching Susan Sarandon in her seats, right to the left of the stage, watching them. It felt like, "They're really not ours anymore, they belong to this sort of bigger world." It felt like a graduation, which is an ending of sorts, but also the beginning of so much to come, as evidenced by their careers. It's wild to be putting out this book with so much going for so many of these bands. Kings of Leon, LCD Soundsystem, The Strokes, Interpol, Grizzly Bear — everybody's doing stuff. They're all just as in the mix as ever. When these bands were getting big, I read a lot of articles about them and I wrote articles about them and there was often a defensive tone in what they said. I understood that to an extent because there were a lot of people coming at them or talking s*** about them. There was often a wariness in the way these groups responded, but the band does not sound wary at all in the interviews in the book. Do you feel like with some of the people you talked to there was a relief and unburdening that came with sharing these stories and feelings? Mostly people would do these interviews and then I would get these emails like, "Oh my God, what did I say? Is it going to be okay? Were other people this forthcoming?" With oral histories particularly there's a nervousness about what other people are saying, because they know it's going to be put next to other people's quotes. But that encouraged the unburdening that you're describing. It was sort of like, "Well, wow, everyone else is talking about this stuff and I want to too. It would feel good to say some of this stuff out loud." I definitely heard that. After my interviews I would hear either, "Oh my God, what did I say?" or "That was actually really healing." I think that the form lends itself to both of those impulses. There's a lot I learned in the book, and then there's stuff in there that was talked about at the time but wasn't printed or said publicly. When it's happening, you think of it as gossip or whatever, but put in the context of the book, it's sometimes the most crucial part of the story. I'm not offended by the word "gossip." I know that it has a negative connotation, like it's all catty or something, and look, there's a reason I chose to do this as an oral history, and that was a big part of it. I write a lot of longform profiles and think pieces (which is the worst, most pretentious phrase ever) in which my sense of authority about what happened or didn't happen is the thrust of the story. That's not the case here. And I knew immediately upon wanting to tell this story that it would be inaccurate, weirdly, to do it that way. When there was gossip going around during the years that this was happening, like, "So-and-so is doing drugs" or "So-and-so is sleeping with so-and-so," you stay away from it as a journalist because what's the relevance to this band's story or to this record coming out? But when you're trying to capture how it felt to be there during this time, or what these characters at play in New York's larger story were feeling, they all heard that stuff too. So if one band member is shooting his or her mouth off to the press about inter-band dynamics and the other band members are pissed off about that, that's relevant to a story about how it felt to be there during that time and how it felt to be in that band during that time. Also there is a lot that isn't in there. A lot. I thought long and hard about what to include and what not to include. The barometer I used was: Does what was said pertain to this band's emotional truth or to this person's emotional truth? And if it didn't, if it was just kind of fun to know, it didn't get in the book. Do you mean the more salacious details? One example that comes to mind is when people are talking s*** about James Murphy, or saying that he was difficult to work with. And they're saying that colorfully. That's relevant. One of my favorite exchanges in the book is where somebody is saying that James' best friends will call him a c***. That's a serious thing to say. Then James is like, "I found this tape of myself when I was a 13-year-old kid at band practice and I was already riding everyone." He's sort of like, "This is part of my personality profile." It's a fun, dirty, potentially gossipy way of expressing something that's also really important for the reader to understand, which is that this guy was onto some of the most important and influential sounds of his era, and he was also really hard to get along with. And he was aware of that and it was also worth it. So that makes it in. There's other stuff, either people slagging each other off, or gossip about who was sleeping with whom and stuff like that that just didn't affect the band's actual stories as far as I could tell. That just didn't go in. Personally for you, what was it like being a young person and a writer in New York during this time? It was so fun. It was also really confusing and drunken. People are like, "What's your next book?" And I'm like, "First of all, shut up. Second of all, never again. Third of all, I will never write a book like this again, or anything like this." Of course I don't really mean any of that, but my instinct to respond that way reflects the fact that this is a unique story. It's not like I can ever do this again, because it's personal. I might write something personal again, but even though I'm not a character in the story, and I'm only on the page in the introduction, it is my story and I was there. A lot of the shows that are mentioned are things I went to. Some of these people I knew personally, some I didn't, but for the most part all of their music was the soundtrack to my early twenties in the city, a time when I was beginning to get up the nerve to say that I wanted to do this kind of work for a living and really had no idea how to do that. I spent summers in the city but I finally moved there after college and I lived with Sarah Lewitinn, she was my roommate. And I taught second grade at an all boys private school on the Upper East Side. So I would party 'til two or three in the morning and then roll into bed and then roll out of bed at 6:30 and get the F Train up to the Upper East Side and be sort of smearing my make-up off my face on the train and kind of attempting to clean myself up. Then I would teach second grade, and then I would go home after dismissal and sleep for a couple hours and do it all over again. That period of time was a real double life and it was also unbelievably exhilarating. One of the things that a lot of these bands and sort of general sources say about that time is nobody thought that anyone would ever care. And I certainly stand by that. By the time I was living in New York, The Strokes were kind of already blowing up. A little bit earlier I remember seeing the import version of Is This It displayed in Virgin Records on 14th Street and being like, "Wait, what? That's Nick's band! Holy s***!" There's this great quote that Dave Sitek [of TV on the Radio] says in the book about how, "Everyone reading this has more perspective on what happened in New York. My perspective was, 'Oh yeah, and then I replaced that tape machine.'" What lasting importance do you think has emerged from the artists covered in the book? What happened in New York City during those early years when I was changing into a more conservative skirt in the bathroom at the Buckley School has actually influenced how people conceived of culture around the world for the following 10 years. There's a joke that James Murphy told me when I was interviewing him that isn't in the book, but basically I was trying to broach the subject of [modern] Brooklyn, like, "But it's terrible there, right?" And he was like, "Oh yeah, that's all our fault." I mean, it's nobody's fault, but it was clear to me that this thing that had begun as friends in bars had become much bigger than that and had influenced all these different aspects of culture, from the fact that there were weird vintage T-shirts at my Target in New Mexico where I'm from, to the fact that kids of my parents' friends would be asking me if I could get them into see, I don't know, Longwave shows. The other thing I would say about that in terms of the broader resonance (and it's all covered in the book), is that 9/11, the internet, Brooklyn, money, politics — all of these things intertwined to make these bands' particular stories relevant in broader cultural ways. That doesn't always happen. We sit here now and there's tons of amazing music being made, but two of the interns for this project are now successful musicians on their own — Maggie Rogers and Eva Hendricks, who's in this band Charly Bliss. When I first hired both of them, Maggie was obsessed with Regina Spektor and Eva was obsessed with Julian [Casablancas]. And very quickly they became obsessed in the other direction. It was sort of like, "Okay, these are the heroes of the next generation of the young artists." And that was news to me. Which is to say that I will never have a completely clean perspective on this because I lived through it, but it's also to say that as a culture journalist, I do think that this period of time was really relevant and that we're still seeing the impact of it play out in a variety of way — in music certainly, but in culture more generally. There's are part in the book where people are talking about Alan Light [the editor-in-chief of SPIN at the time] and how his staff have to convince him to cover this stuff because he was worrying, "Does anyone outside of New York care?" Do you think people outside of New York are conscious of the scene's impact or is it a more subconscious impact? I think the people who pay attention must be aware because there are still kids coming to Brooklyn, but I guess there are also kids coming to Philadelphia now. I don't think people are aware of the extent of the impact. I think if you asked the average Killers' fan, "Do you think that The Killers were able to get famous because of what The Strokes did first?" that they would respond, "What are you talking about?" I don't think they would make that conclusion, which seems pretty obvious to someone like you or me. I completely agree. Maybe that's part of the point of writing this. It's not like I want to evangelize or proselytize the import of this period of time. It's more that a lot of the time good writing is about expressing something that seems obvious to you in a way that will then seem apparent hopefully to anyone who reads what you've written. I didn't write this book so that everyone would give credit where credit is due. It's not really about that. To me it's very obvious, and to you it's probably pretty obvious, and to a lot of people it's pretty obvious, but I don't subscribe to the idea that often happens in indie culture where it's sort of like, "It doesn't count if you like something and don't know where it came from, or if you aren't appreciative enough." I think The Strokes deserve a lot of credit, and I think that comes across in the book, but I didn't tell the story of The Strokes to get them credit. I wanted to bring people back to this period of time that was so fun and wound up being really influential, but that's not why we're telling this story. The way the book is structured is really intentional. I was trying to figure out how to put all this together. There was thinking that maybe I should do, for example, a chapter on internet culture, or a chapter on downloading and pull those themes outside of the narrative. And I was very quickly like, "Absolutely not. Anything that comes up that's sort of high concept thinking has to be born out of the on the ground experience of these bands." The example that really clarified this for me was downloading and leaking. Instead of having a chapter on that, the discussion mostly really comes by Interpol watching the Antics leak. This book isn't about correcting the record or telling people what's what, it's about: Here's what it was like to be here then, And yes, you may also learn that The Killers would not exist if Julian hadn't been Brandon Flowers' hero. How close were you to getting the now-press shy Carlos D [of Interpol] to talk for this? Oh God, the white whale of this book. I mean, very close, to the point of, like, he may have wanted to take a restraining order out on me at the end. I've known Carlos over the years and he was very, very polite about it, but he just vigorously and relentlessly declined to participate. So I think I was close, but maybe I was never very close. I certainly tried. It's a bummer. Was [The Strokes' young manager] Ryan Gentles good at his job? Yes. I think Ryan is one of the heroes of the story to me. Everyone in the book who knows anything about this, including members of The Strokes, will tell you that The Strokes are difficult to manage. Ryan really, really understood them and understands them. Some people will think he did the best job he could have under the circumstances. I wouldn't say it that way. I think he did a really good job with a hard task. Why is Andrew WK not in the book? I love Andrew WK, he would have been a great addition to the book. I know that I vaguely attempted to reach him, very early in the reporting of the book. There were attempts, but I would not argue that I tried really hard and he wouldn't do it. There are a lot of people that you could argue should be in here, like a lot. That haunts me, you know? It's there and it's done for posterity, but you can ask my publisher, they had to rip it from my hands in order to publish it. I think that a book like this, with this many moving pieces and this many characters, is always unfinished. He's a good example of somebody that would have made a great addition and just isn't in it. Part of the thing I really like about the book is that you do include mentions of bands like The Star Spangles, who were a band you had to pay attention to for three months. Nobody is arguing, least of all me, that this is the whole story. As complete as it is, it's inherently incomplete, and that's how it felt to be there. You're in the thick of it and you're also like, "Wait, what's happening?" That's accurate to me. That is accuracy to me.